Ziggy with his customised cart. A Dropbox file of images and video is available here. The future seems bright for Ziggy the three-legged wonder dog, after specialist surgery at The University of Queensland’s Veterinary Medical Centre at Gatton. Thanks to the care and dedication of his owners, UQ veterinary staff and students, Ziggy is a poster dog for success in the face of adversity. 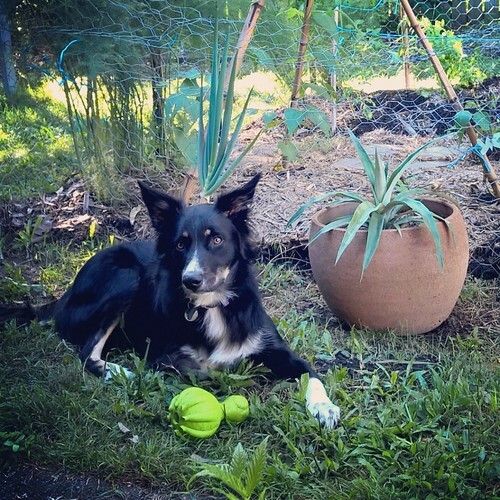 Now a two-year-old border collie with a very sweet disposition, Ziggy was found abandoned in 2014 while still a small puppy. His front right leg was broken and healing incorrectly, requiring amputation. UQ PhD students Rebecca Colvin and Glenn Althor fell in love with the brave little dog and adopted him when he was three-months-old, from the RSPCA at Wacol. “He was a happy little puppy and didn’t mind at all that he only had three legs,” Rebecca said. Senior lecturer in small animal surgery at the School of Veterinary Science Dr Jayne McGhie said Ziggy’s owners had done the right thing in seeking veterinary advice. Dr McGhie said that in all young animals like Ziggy, the bones grow from cartilage zones (growth plates) within the ends of the bone. The cells within these plates can be damaged by any type of trauma. In Ziggy’s case, the damage was likely due to the increased weight carried on his one front leg after his amputation. Having the bones grow abnormally meant that Ziggy developed a ‘bent and twisted’ front leg and this resulted in an inability to walk or run normally or without pain. “We knew we needed to save Ziggy’s remaining front leg to give him a chance at a normal active life,” Dr McGhie said. Ziggy underwent surgery in 2014 to stop the deformity in his leg from getting worse while he continued to grow. A part of bone in his leg was removed and his front leg was splinted so the bone was supported to grow straight. After the splint came off last year, Ziggy’s owners bought a semi-customised splint to protect his carpal joint (the joint at the top of his foot) from damage because of the abnormal way Ziggy walked. But without corrective surgery to straighten Ziggy’s front leg, his long-term prospects were poor. Within a few months, Ziggy started to develop arthritis in his carpus and stretching of some of the carpal ligaments. He would need corrective surgery once he was fully grown to maximise his chances of living an active and pain-free life. In the lead-up to the surgery, Rebecca and Glenn bought a cart customised to his measurements so he could still run around and play without bearing weight on the leg before and after surgery. “In planning for the surgery, we had assistance from UQ VETS Small Animal Hospital radiologists Dr Alana Rosenblatt and Dr Katrina Garrett, Professor Chris Pollitt of UQ’s School of Veterinary Science and Associate Professor Jennifer Loy and Mr Chris Little of the Queensland College of Arts at Griffith University,” Dr McGhie said. Dr McGhie and Dr Lance Wilson performed the corrective surgery on Ziggy just before Christmas 2015. They cut and realigned the abnormally-shaped bone according to calculations made from the 3D models and then held in place with an external frame, known as a hybrid external skeletal fixator. Ziggy’s owners used his forelimb cart and a body harness to manage Ziggy during the early part of his recovery when he was unable to weight bear on his front leg. Eight weeks after surgery, the external fixator frame remains in place and his bones are healing. Ziggy is also walking on his repaired leg without any assistance. “He has just become stronger and stronger every day,” Rebecca said. “His recovery has astounded us, as has the improvement to the shape of his leg. Ziggy is now a firm favourite with UQ staff and students and feels right at home with the world class-care at The University of Queensland’s School of Veterinary Science, which celebrates its 80th anniversary this year.